The following article introduces a new model for the preservation of archaeological and architectural heritage within an urban green space by highlighting an ongoing project at Blackfriary in Trim, County Meath, Ireland. Blackfriary, a medieval Dominican friary, was founded by Geoffrey de Geneville, Lord of Trim, in 1263 a.d.The site is located 63 meters above sea level on the northern side of the River Boyne in the town of Trim within a field approximately 2 hectares (4 acres) in size. It is bounded on all sides by houses and to the southwest by a supermarket. Despite centuries of neglect, the ruins of the friary remain largely intact as a series of hummocks, or low mounds, below the modern surface. The field beneath which the remains are located is currently covered in grass and scrub. A bank and ditch run north-south through the center of the site and may mark the limits of the Friary precinct (to the west), while the eastern portion of the site was most likely the location of small fields or kitchen gardens associated with the Friary. The Blackfriary project is an initiative of the Irish Archaeology Field School (www.iafs.ie) and Cultural Tourism Ireland (www.culturaltourismireland.ie), working in partnership with the local community, local businesses, and local government authorities. The project is a pilot for a movement called CHAT (Cultural Heritage Amenity Town) that aims to use Ireland’s greatest assets (its culture and its people) to build cultural heritage and amenity projects. CHAT is founded on the premise that for a town to be an attractive destination for visitors, it must first be a cherished home for its local community. CHAT uses cultural heritage as a driver to connect communities to their towns and encourages them to improve their towns and cultural assets to attract visitors. The goal is to join together a local community and its heritage to present a marketable, high-quality experience for visitors that travel to CHAT sites and stay in the area. CHAT aims to provide a new vehicle for an innovative and sustainable tourism and education based economy centered on local community engagement with its heritage. The concept, envisaged by the authors, made it to the final 25 shortlist of over 9,000 entries in Ireland’s 2010 “Your Country Your Call” competition. The project was showcased at the AIA Gala in New York City in April 2011 and was awarded funding through the Institute’s Site Preservation Program. The name Trim is derived from the Irish “Ath Truim” meaning “the ford of the elder tree” (Herity, 2001, 67). The town was established by Walter de Lacy in the early phases of the Anglo-Norman conquest of Ireland (between 1194 and 1199). Evidence indicates the existence of burgages and burgesses in Trim before 1188 (MacNiocaill 1985, 374-5), but a monastic site existed there since at least the sixth century (Potterton and Seaver 2009, 37, 54). The town had a clearly laid out municipal structure allowing for a degree of self-government. Town officials included a portreeve (mayor), a recorder, a town clerk, and two sergeants at arms (Lewis 1837, II, 644). Trim grew rapidly due to its dual function as a commercial and administrative center for the new lordship. The River Boyne was navigable as far as Trim, giving access to the port at Drogheda (Hennessy, 2004, 3; Potterton, 2005, 157). Agricultural produce was brought to the town from the surrounding areas, both for processing and transport to the ports, as the Norman colonization initiated a rapid increase in the production of grain for overseas markets. An annual market in Trim attracted buyers and sellers from across Europe. Geoffrey de Geneville, Lord of Trim, was a French nobleman in the service of Henry III of England (Potterton 2005, 319). He obtained his title by marrying Matilda, the granddaughter of Walter de Lacy, and controlled a wide area known as the Liberty of Trim. De Geneville spent his final years at the Friary and was buried there in 1314. The Friary was of considerable importance and was the location for a meeting of Irish bishops in 1291 and for Parliamentary meetings in 1446 and 1491 (Hennessey 2004, 10). It was suppressed in 1540 with the church cloister, chancel and other properties being sold to the Bishop of Meath. A belfry, chapter house, dormitory, hall, three chambers, a kitchen, a pantry, and a stable are mentioned in historical records dating to 1541. The Friary also held 72 acres of estate land. In 1988 a geophysical survey was carried out by Professor William Kennedy of Florida Atlantic University which suggested a layout for the Friary buildings (Kennedy 1989). The position of the Friary cemetery to the southwest of the Church was confirmed by recent excavations arising from town redevelopment works which uncovered eleven burials (Seaver et al. 2009). The Irish Archaeology Field School (IAFS) commenced research at Blackfriary in 2010, undertaking geophysical and topographical surveys in an attempt to determine the extent of the Friary’s ruins. The results of the geophysical survey were hampered by metalliferous debris scattered over the site due to illegal dumping. However, the topographical survey successfully located and delineated the remains of the friary buildings. Archaeological excavations started in the summer of 2010, with the participation of over 40 students from Australia, Britain, Canada, Italy, Ireland, and the United States. Students who attended for at least two weeks were eligible for university credits through Dublin City University. In addition, a number of local enthusiasts and cultural heritage tourists joined the team. Two excavation units targeted the area of the church with visible pieces of collapsed masonry. Excavations uncovered the remains of in situ walls that likely formed part of a belfry tower adjoining the church on its north side. Fragments of medieval pottery, some iron objects, small pieces of plaster (some of which had traces of paint), and two fragments of stained glass were recovered. The presence of a tower was confirmed by the location of two masonry plinths. Remains of the superstructure consisting of large pieces of masonry from a spiral staircase were also found as was a relieving arch that would have supported a second storey. Preliminary examination of these remains suggests that the tower may have been square, about 4.4 meters in external width, and may have been accessed from the domestic range to the northwest of the church. The recovery of human bone from various layers of rubble fill and from a possible floor level suggests that there was a great deal of disturbance to the floor of the church, where it is likely that a number of burials occurred. The presence of painted plaster and stained glass confirms that the church was well appointed. Other contemporary sites where stained glass and painted plaster fragments have been found include the Cistercian foundation at Tintern Abbey (Lynch 2010) and the Augustinian Friary at Kells (Clyne 2007). The 2011 season commenced in May, and as of the writing of this article, work is ongoing with both international and Irish students and non-professional enthusiasts, such as locals and tourists. The highlights of the excavations so far have been the discovery of the south wall of the cloister (including the well preserved southwest corner and sizeable pieces of beautifully dressed columns and capitals from the cloister arcade) and numerous burials including the intact skeleton of a 10-12 year old juvenile found within the cloister garth under just 20 centimeters of topsoil. 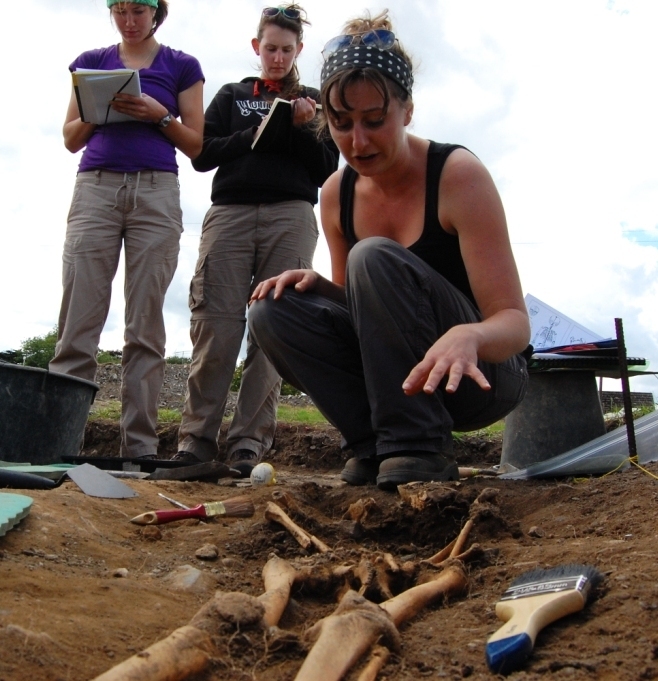 The skeletal remains uncovered to date are fascinating as they raise questions about how long the site was used as a graveyard by the people of Trim. Perhaps, after the dissolution of the monasteries, Blackfriary was the only consecrated ground available to the local Catholic population for burial. 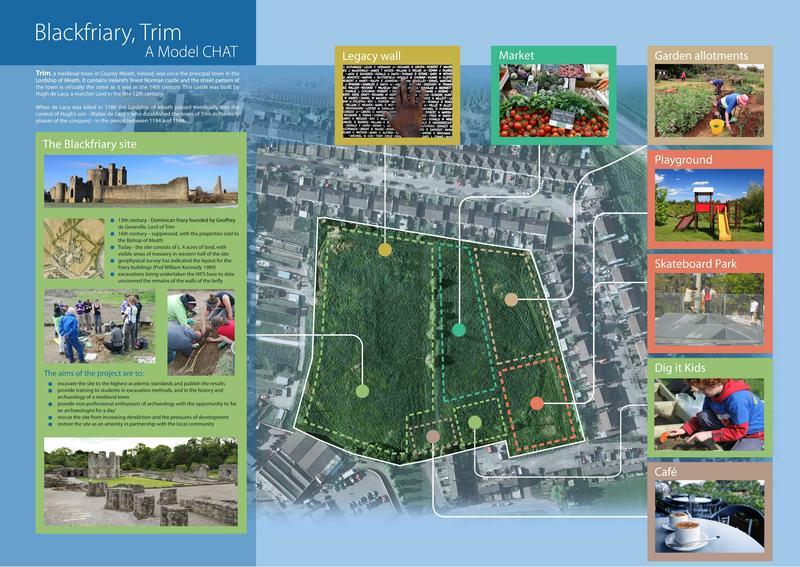 The Blackfriary site and the town of Trim, 45 minutes north of Dublin, are an ideal pilot for the development of the CHAT concept. Trim, an historic town with a largely intact medieval street pattern is located in the heart of County Meath, the heritage capital of Ireland, which contains an incredibly rich archaeological and historical heritage, including the UNESCO World Heritage Site of Brú na Bóinne (Newgrange, Knowth and Dowth). The town boasts a wonderful array of upstanding archaeological features, including a conserved castle, which was used in the filming of Braveheart. Blackfriary is located at the northern outskirts of the town of Trim. The site has been derelict since the eighteenth century. Although it is owned by the Town Council, the presence of archaeological remains coupled with a lack of funds meant that it was not possible to realize the site’s potential as an asset. The Blackfriary project is attempting to address this situation. 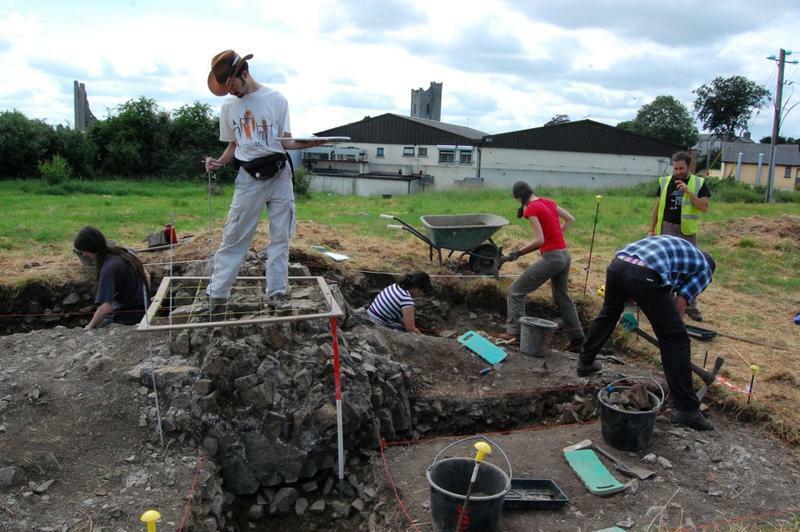 Excavations at Blackfriary by the IAFS over a 10-15 year period will bring over 1,500 archaeology and anthropology students to the town of Trim. In addition, through Cultural Tourism Ireland, interested individuals, groups, and families can also participate in the excavations, where they will experience the same training and sense of discovery as the students. The remains of the friary and associated buildings exposed by the excavations will be the focus of a conservation program that will provide accredited training for architectural conservation students. These excavations and conservation efforts will allow the footprint of the site to be presented to the public along with information panels and displays that will provide explanations and interpretations for the visitors. The results of the excavation will also be distributed in various formats, from social media such as blogs and Facebook, to peer reviewed journals. The role of the archaeological team is to identify, assess, and delimit the archaeological remains on the site. Through liaising with the relevant authorities, the most appropriate course of action for the various findings will be determined, be it preservation in-situ, conservation, or full excavation (preservation by record). This process will allow for areas of green-space to be handed over to the local community over time. The local community will be able to use the space in manner that realizes the economic and educational potential of Blackfriary such that the site will become an amenity and attraction for the local community, students, and tourists, both during the excavations and in the future. The CHAT concept encourages the local community to connect with the rich cultural heritage of the town to ensure the preservation of the archaeological remains and to realize the economic and educational potential of the site. The excavations at the site are already well known and welcomed within the town. Engagement in the project is being achieved through encouraging the local community to visit and even participate in excavations and by undertaking a program of outreach events and public consultation. By engaging the local community, the authors plan to tap into the enormous potential for the development of the remainder of the field as an amenity for the town and as a tourist attraction. Whilst some possible uses are presented here to illustrate the amenity potential of this green space (Figure 7), one of the key concepts of the CHAT model is that these decisions be made by the local community. To achieve this, a Blackfriary committee is being established comprising representatives from local residents, local businesses, community groups, the local authority, and the archaeological team. It is intended that this committee will take the lead in planning and implementing the various phases of site development, including the raising of funds required to achieve this. · Attract enthusiasts who wish to re-engage with their ‘inner archaeologist’, by facilitating their participation, not just as observers, but as excavators as well. Additionally, presenting Blackfriary as a CHAT site will integrate the archaeological site with the town in a way that will ensure its long-term protection. The exact nature of how the space is used will evolve from the wishes of the local community combined with the need to preserve and protect the archaeological and architectural remains of the Friary. The vision of CHAT is for the inhabitants of Trim to see the Blackfriary site, currently a derelict space, as an asset and compatible with community use. In the future, we hope this model can be extended to historic towns throughout Ireland. Barry, T.B. 1987. The Archaeology of Medieval Ireland. London. Clyne, M. 2007. Kells Priory, Co. Kilkenny: archaeological excavations by T. Fanning and M. Clyne, Archaeological Monograph Series:3, Dublin. Hennessy, M. 2004. Trim; Irish Historic Towns Atlas, No. 14.Royal Irish Academy, Dublin Irish Record Commission. 1880. Irish Patent Rolls of James I. Dublin. Kennedy, W. 1989. AnArchaeological Survey of the Blackfriary Site, Trim, Ireland, Report to the Office of Public Works, Florida Atlantic University. Lewis, S. 1837. A Topographical Dictionary of Ireland. London. MacNiocaill, G. 1985. The colonial town in Irish documents. In H. B. Clarke & A. Simms (eds), The Comparative History of Urban Origins in Non-Roman Europe, 373-78. Oxford. Potterton, M. 2005. Medieval Trim, History and ArchaeologyFour Courts Press, Dublin. Seaver, M., Kelly, M. and Travers, C. 2009. ‘Burials at the well: excavations at the Black Friary, Trim, in M. Potterton and M. Seaver (eds) Uncovering Medieval Trim Four Courts Press, Dublin. The first time I went to Ireland to participate in the Irish Archaeological Field School was my first time traveling out of the country alone, as well as my first real excavation experience. I had no idea where I was or what to expect. The second time I went, I could barely contain my excitement because, in a sense, I was going home. Because that’s what the IAFS teams is: family. Both times, I have been amazed (but welcomed) how quickly the students bond with one another. Thanks to my IAFS experience, I have made friends from all over the world and from all across my native United States. It was for that reason, even, that I found myself in Australia this past semester on a study abroad experience, taking university classes with team members and friends from my first field school group. To add to it, directors Steve Mandal and Finola O’Carroll, supervisor Gianmarco Cattari and course administrator Bairbre Mullee are a part of the family as well, and each is extremely welcoming and supportive in his or her own way. But let’s not forget: it’s not all about the people you’re with, but also what you learn. In my opinion, the learning environment is just as amazing as the “family” atmosphere. The IAFS team welcomes students with any level of experience, and will teach and expand the student’s knowledge to his or her individual needs. All aspects of the excavation are taught, from excavation techniques to surveying techniques, recording techniques and onward. As excavation often leads to unexpected discoveries—as it did this past season with several burials and the decorated arcade of the cloisters—the team is very good at adapting to meet the needs of the site and those excavating it. The practical knowledge that comes out of an excavation such as this, along with the memories that come alongside it, is a unique and beneficial experience I would recommend to any archaeology student or even any person merely interested in this field. 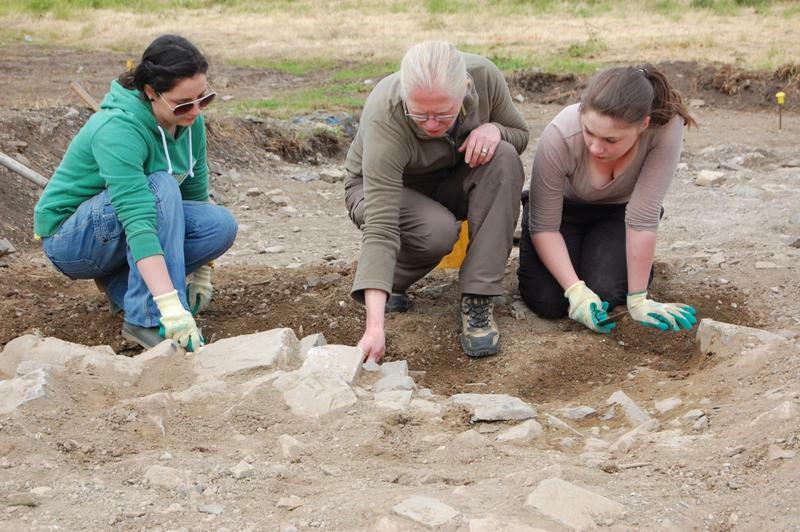 The Irish Archaeological Field School provides students with wonderful learning opportunities. Students have the chance to participate and learn about archaeological excavation and post-excavation work. 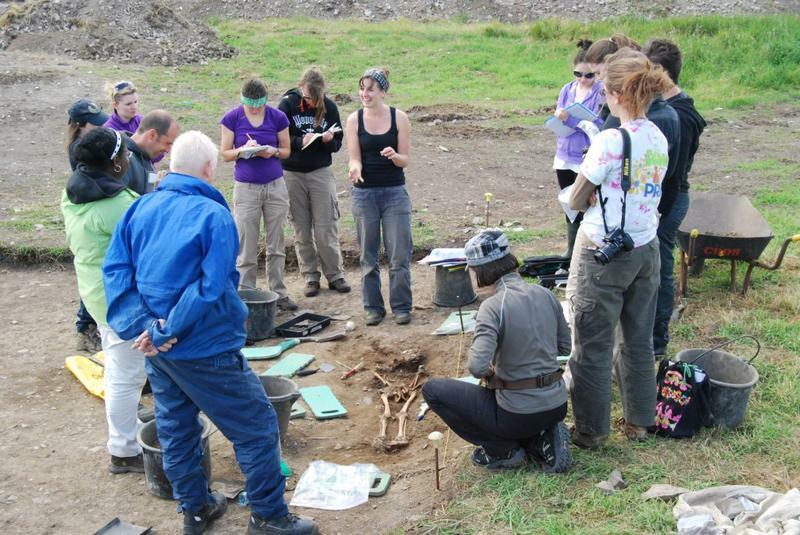 The possibility for students to undertake such a variety of tasks allows them to develop the technical and interpersonal skills that are required for team work and archaeological field work. The IAFS team is kind and attentive; creating a comfortable and encouraging learning environment for students. I have had the opportunity to participate in the school's past two field seasons. As a result of my participation, I have gained skills that I would not have been able to acquire in a classroom setting. Experience in the field has helped me approach archaeological theory in a logical manner and has enabled me to think critically about archaeological research. The knowledge I have gained is invaluable and I hope that I will have the opportunity to participate in future digs with the IAFS. Students have the chance to learn about an interesting discipline with an amazing group of individuals. I highly recommend this field school and opportunity to others. Admiring the dedication you put into your website and detailed information you offer. It's great to come across a blog every once in a while that isn't the same old rehashed material. Fantastic read! I've bookmarked your site and I'm including your RSS feeds to my Google account. Director Stephen Mandal presented two lectures in Boston last week. Archaeologists describe their innovative plan for the preservation of archaeological and architectural heritage within an urban green space by highlighting an ongoing project at Blackfriary in Trim, County Meath, Ireland. The Archaeological Institute of America (AIA) will fund archaeological conservation and research efforts at two medieval sites in Ireland.